The marriage of a significant photography project (with stellar imagery and prints) and the undeniably finest publishing house in the world results in a creation and collaboration that rises to the level of something quite spectacular. 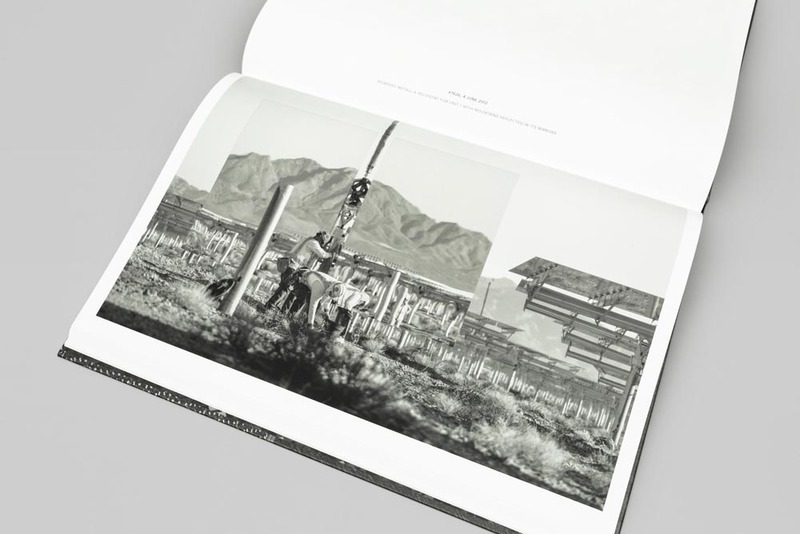 In this case, Jamey Stillings was the creator of that stellar project and recently joined forces with Steidl books to publish The Evolution of Ivanpah Solar. 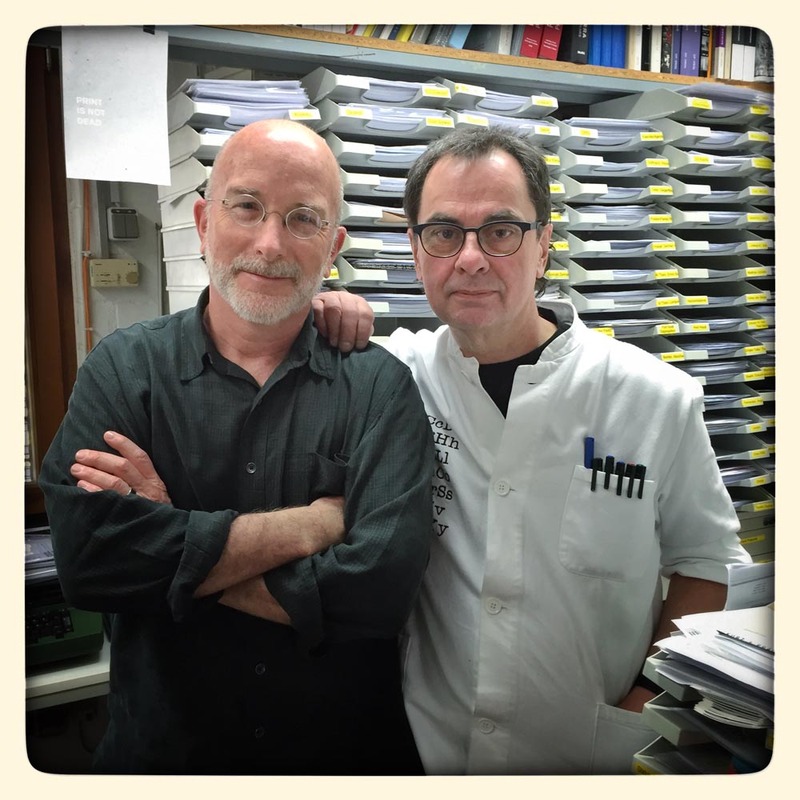 Jamey kept a diary of his on-press experience at Steidl and today, he shares that journey from photographs to book. Jamey will also be presenting this project on Friday, March 11 at 10 am, at the SPE National Conference with a lecture, “Changing Perspectives: Energy in the American West”. 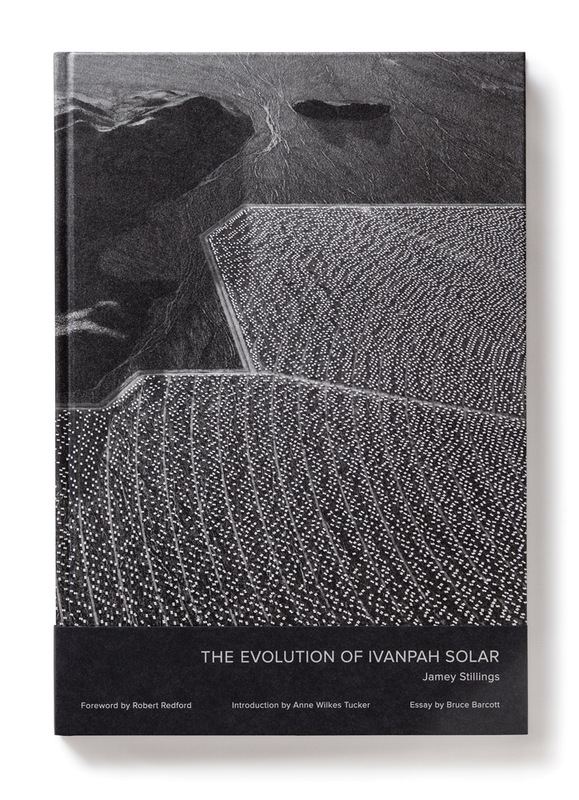 In The Evolution of Ivanpah Solar, published by Steidl, “Jamey Stillings synthesizes his environmental interests with a long-held fascination for the intersections of nature and human activity. 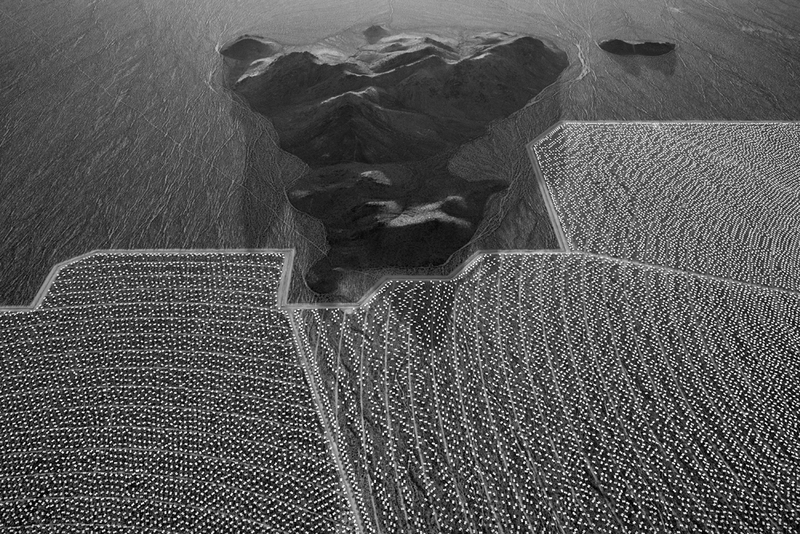 In October 2010, before construction commenced, Stillings began a three-and-a-half year aerial exploration over what has become the world’s largest concentrated solar power plant, the Ivanpah Solar Electric Generating System in the Mojave Desert of California. 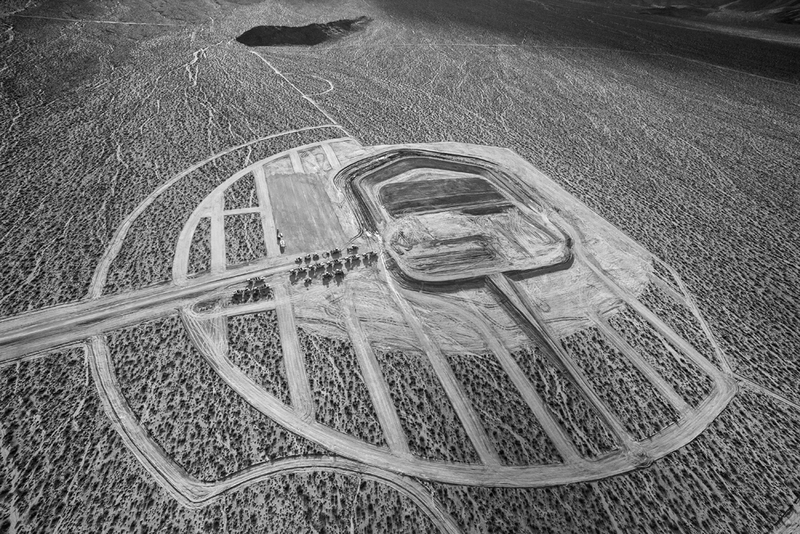 From the stark terrain of the pre-construction landscape to the angular forms of the completed solar plant producing 392 megawatts of electricity on 14 square kilometers of public land, Stillings explores transformative interactions between raw natural forms and the project’s precise geometric lines. Photographing from a helicopter during first and last light, Stillings’s images incorporate tight abstractions, oblique views of geologic forms, and broad open views of the dramatic desert basin. 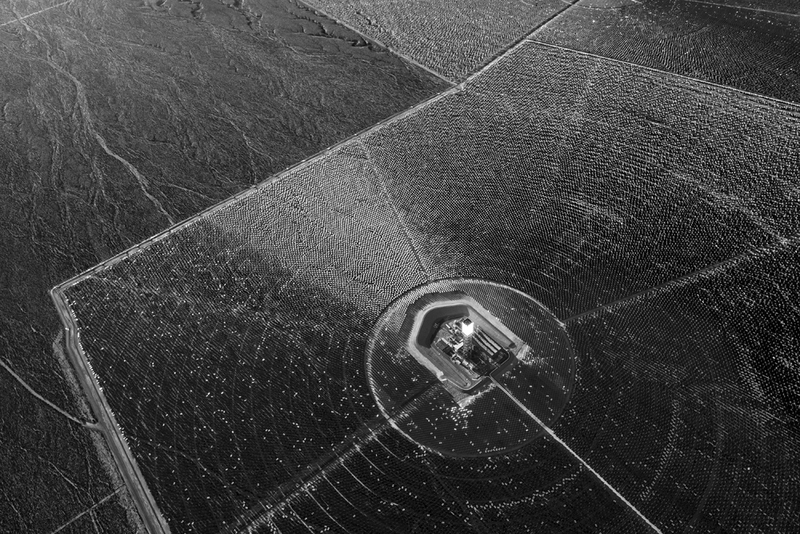 Renewable energy projects like Ivanpah ironically question our perceptions of land and resource use, and Stillings has observed contradictions within the environmental movement, local communities, the energy industry and general public. Though Ivanpah was built in the American Southwest, the promise and challenge of renewable energy also raise global issues. (Stillings’s larger project, “Changing Perspectives,” will explore the global state of renewable energy development.) 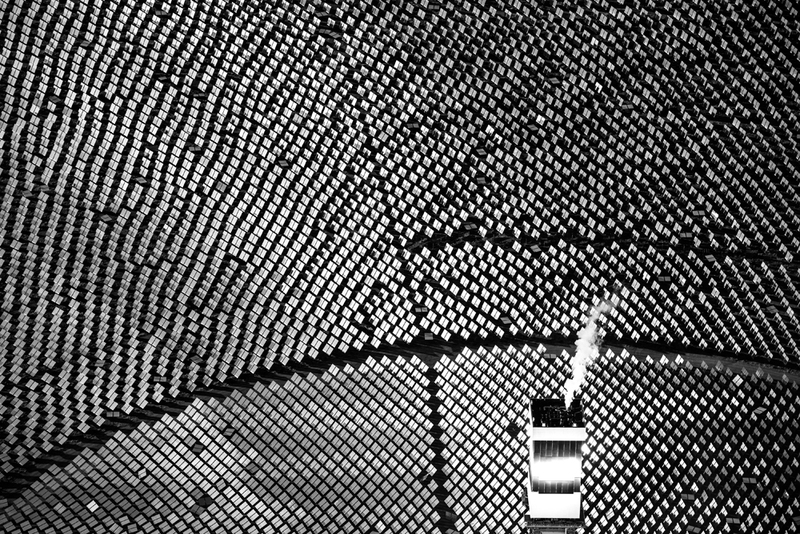 Along our uncertain path toward a sustainable future, The Evolution of Ivanpah Solar both forms part of the contemporary discussion on climate change and imparts a historical perspective”. Jamey Stillings pursues documentary, fine art, and commissioned projects. He holds a BA in Art from Willamette University, an MFA in Photography from Rochester Institute of Technology, and has a diverse range of national and international commission clients. Stillings’ work has been exhibited internationally, and is in the collections of the Library of Congress; Museum of Fine Arts, Houston; Nevada Museum of Art; UNLV Libraries and JGS. His work has been published by The New York Times Magazine, Smithsonian, Arizona Highways, Le Monde, Neue Energie, New Scientist, and Newsweek Japan. Recent milestones: The Epson Creativity Award 2015; TEDxABQ speaker, Sept. 2014; The Center for Fine Art Photography, Solo Exhibition, Fort Collins, CO, Oct. 2014; Etherton Gallery, Solo Exhibition, Tucson, AZ, Nov. 2014: Eliot Porter Grant recipient 2013; Critical Mass 2013 Solo Exhibition Award and Top 50. Stillings published The Bridge at Hoover Dam in 2011 by Nazraeli Press. 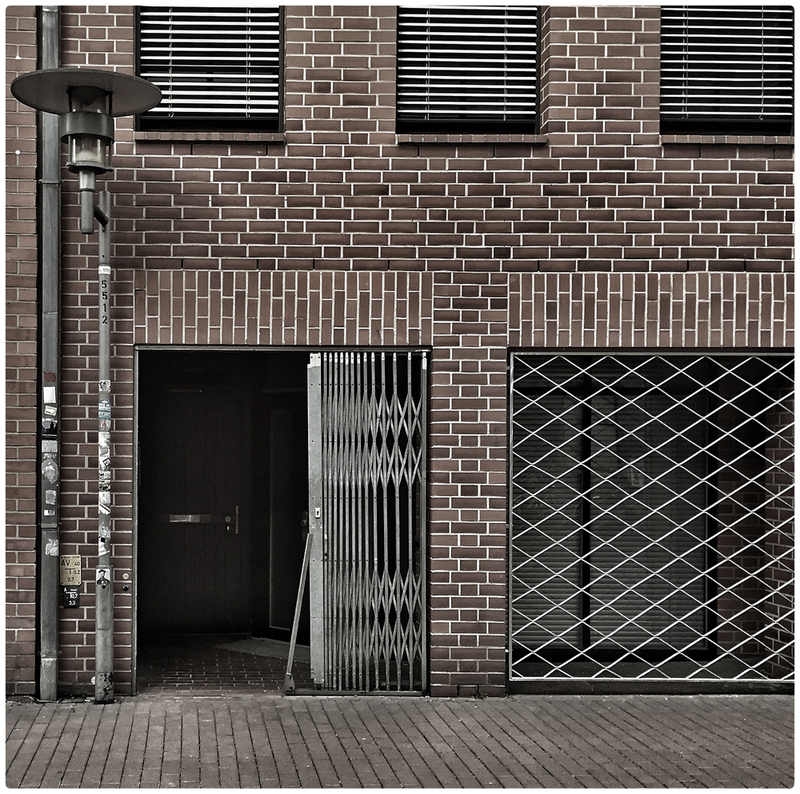 After a trip from Copenhagen to Göttingen that was walk-metro-bus-ferry-train-train-walk, I arrive about 18:30, find someone with my room instructions and key, then make my way over to the Halftone Hotel next to Steidl Verlag and take up residency again in the Lagerfeld flat. 9:30 – I arrive at the requested time to the library on the top floor of Steidl. Maren let me know via email on Wednesday that Gerhard would not be in today. After an hour or so, Bernard lets me know that Gerhard is flying back from Singapore and won’t be in until the evening. No progress will be made today. I have a free day for rest, recuperation, and exploration. I find a nearby laundry service to tame my growing stack of dirty clothes, then set out in pursuit of a rental bicycle. After a few failed attempts, I finally find a shop at the train station with rental bikes. My black upright seven-speed city bike will be my new companion and increase my range of exploration. Neither a mountain bike nor a touring road bike, I nonetheless put it through its paces (and me at the same time) with an evening ride up into the beautiful and lush city forest to the east of town. Bernard leaves me an email. I may get a call from Gerhard about 6:30. If not, please show up in the library at 8:30. 2015.07.10 – Let the games begin! At 6:15, the phone rings in the Lagerfeld flat. I am in slumber mode, knowing I slept too few hours, but challenged by the light of sunrise streaming through my window. “Good morning!” I answer, realizing the phone on the living room desk is the one to answer and not my Handy (mobile). Just before 6:30, I walk up the central stairs of Steidl, let myself into the offices, climb the steps up to the library, deposit my pack, and head down to Gerhard’s office below. He seems remarkably alert and energetic for having arrived back from Singapore the previous evening. Wondering where the book reference prints are, Gerhard suspects they are still in the library after my mid-June visit. He is correct. The library is quiet. No one will be here at this hour unless they are on press. I don’t know who might join me during the day, or whether my day will be spent as a solitary visitor. The warm shower that I wished would introduce me to the day lies next door on the third level of the Halftone Hotel. Not an option! Fortunately, I grabbed salami, cheese, and day old bread from the flat before my departure. The fresh strawberries, lingonberries, and raspberries, along with my yogurt, are in the flat’s shared refrigerator, out of reach. 7:15 – The library phone rings. “We need you down on press.” I had not yet been on the press floor, but before I could ask for directions, the call was over. The educated guess was to keep going down the stairs until the answer appeared. “Drucksaal” on the door gave me my answer. I briefly met the two pressmen, Andrea and Arne, and then Gerhard explained his choice of two greys and a black for the tritone. The first sheet on the viewing table looked great from the start, though a tiny bit dark on one image. The blacks are richer than on the Epson reference prints and the paper more neutral, both of which I like. They realize we are looking at a slightly older sheet, pull a new one, and it seems spot on. 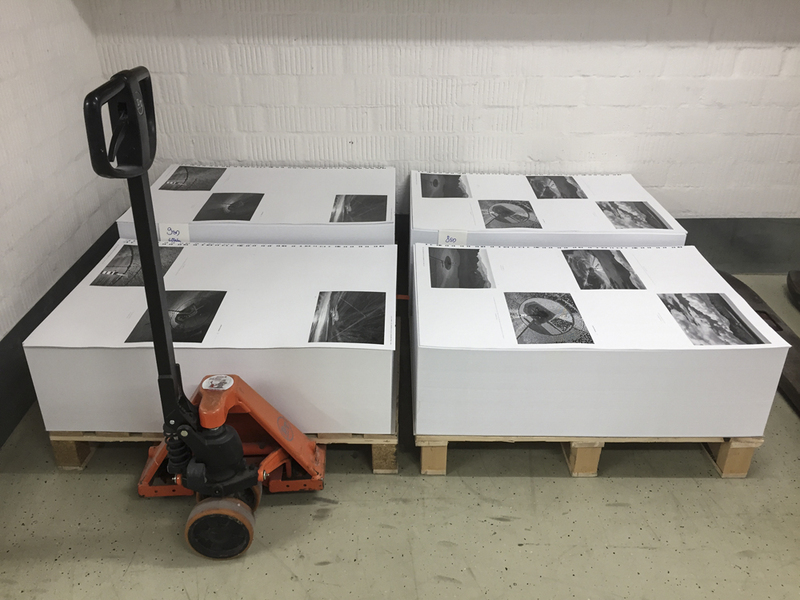 I think the marriage of my approach to image creation and Steidl’s mastery of book printing are going to make for a beautiful book! 8:30 – Ready to view the second sheet. It looks very good, but I wonder if we might add a bit more black. Gerhard agrees and sees no downside. We look at a second sheet and approve it. I explain the project briefly to Andrea and Arne, and then we talk a bit about Playing for Change, as I am wearing my t-shirt. 8:40 – With the printers’ tacit permission, I escape for 30 minutes to prep and eat fresh strawberries and yogurt in the flat, pursue a cafe latte at the nearby Balzac, and pick up my clean laundry from a nearby business. Back safe and sound in the library by 9:10. 9:45 – I just returned from approving the third sheet and from a review of, and a decision about, the text paper for the front and back signatures. We are limited to what text papers are available from a wholesaler in small quantities on short notice. A really nice 100% recycled paper that both Gerhard and I liked was not available. We arrived at a paper (I have to get its name) that was used on a Richard Serra project. The whites are very close, compatible, but do not stand in contrast to each other. This paper is the best available, and a good second option, so this is how we will move forward. 10:35 – I am back from approving the fourth sheet – on the hairy edge of going too deep, but I like it. Must keep an eye out to avoid moving too dark in images of the desert terrain. 14:05 – We are up to our 8th sheet, 31 plates of 60, and all is running well. I enjoyed visiting with the pressmen along the way. Their shift ended at 14:00 and they are off for the weekend. 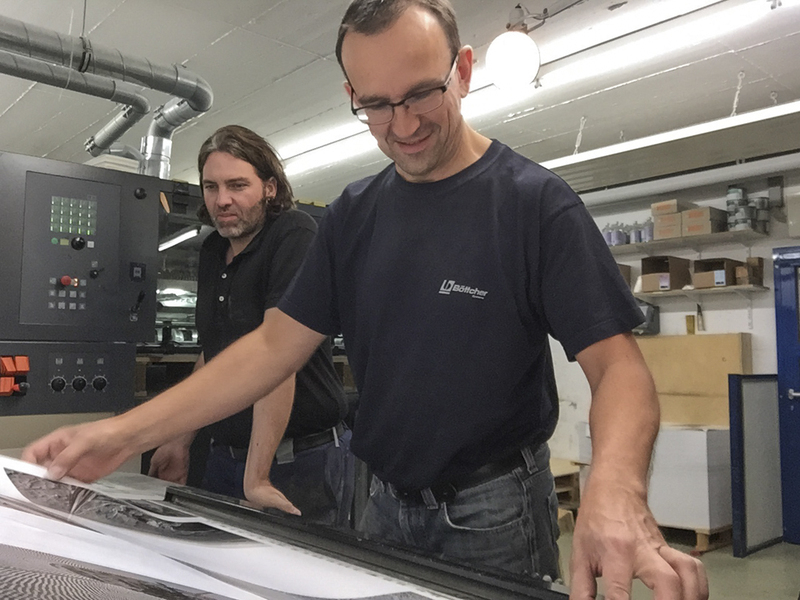 Two new pressmen have taken their place, Florian and Christopher, both a bit younger than Andrea and Arne. Depending upon the workflow, we will be close to completing the plates by the end of their shift this evening at 22:00. Don’t know what the game plan is for the text, endpapers, cover, and bellyband. I think I should check out Airbnb options for the weekend here. 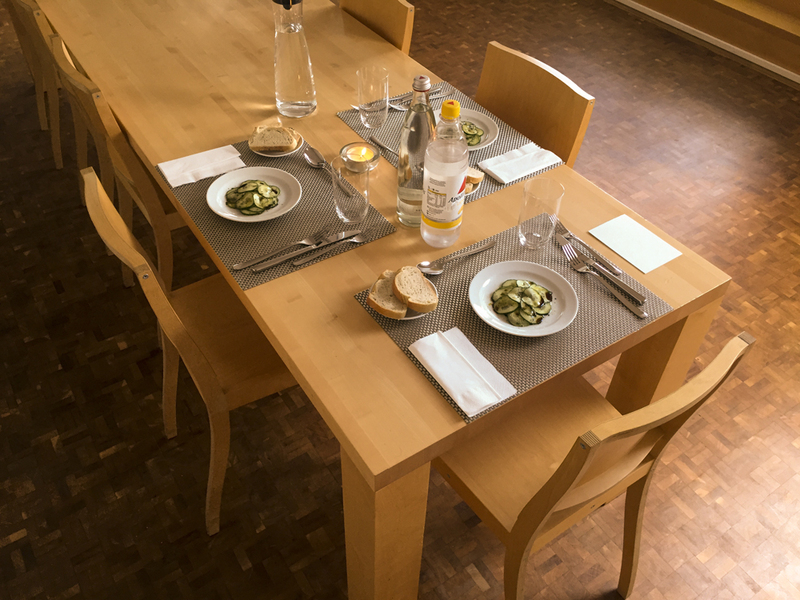 15:00 – Time for lunch! A small lunch today with only Peter Zimmermann (a graphic designer from Zürich), a brief cameo by Gerhard, and myself. Rudy, as usual, made a beautiful meal: a light cucumber salad with fresh bread, white fish with white vegetables on top, and a fresh cherry and yogurt desert. 16:15 – Bernard worked with me on the cover to prep it for reproduction. A bit of image area was added top and bottom to roll around the board and under the end papers. We tweaked the type on the back cover credits, as they were too thin and light to show up properly on the printout. Things are on track. 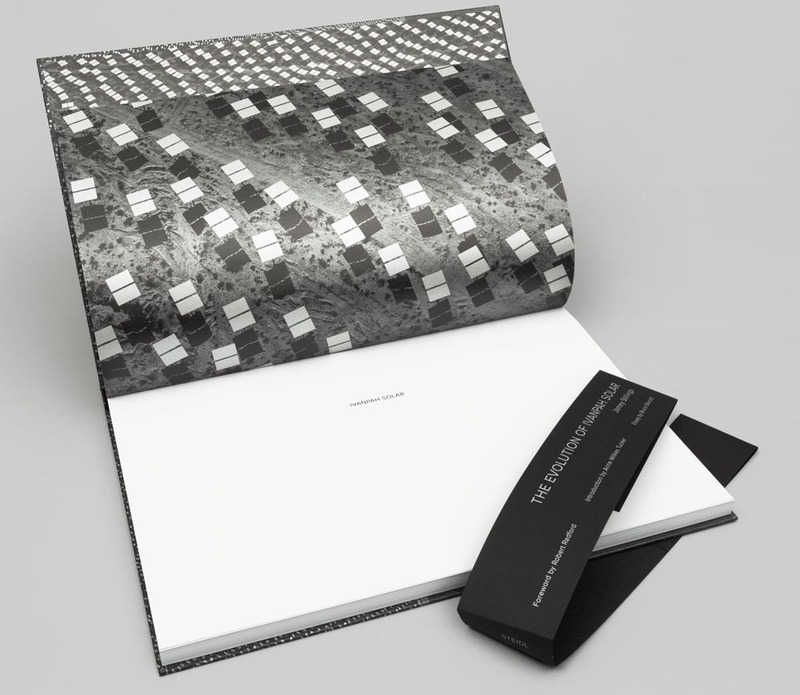 18:30 – We select a silver metallic paper for the end papers and the cover. It looks fantastic! 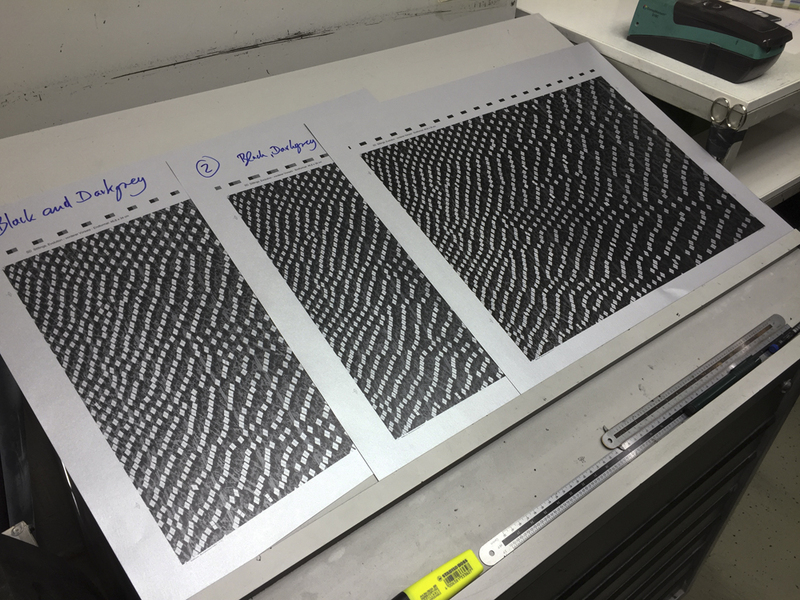 In the case of the end papers, we are printing the images dark and moody while the mirrors retain most or all of the silver base color. The cover will be treated the same way, but will not be printed quite so dark. In the case of the cover, the silver metallic paper gives the image a mysterious and distinct look that will not imitate the plate of the same image inside. 22:30 – I must admit that I am fading. The couch in the library is starting to look good. 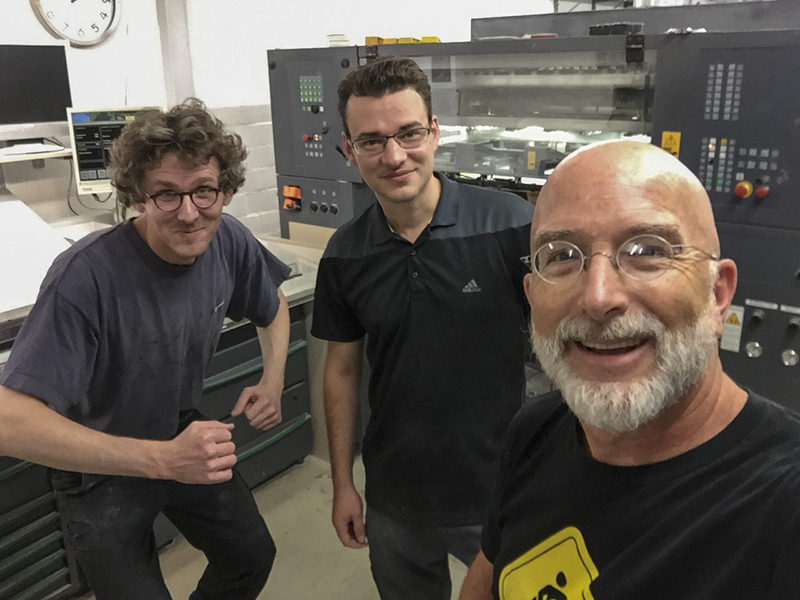 I have lost track of how many sheets are still to be printed, but I don’t think I will be out of here much before Michael’s (the new pressman) shift is complete. 00:25 The Steidl library is a solitary place after midnight. The window is open to the night recreations of students and others, as they wind down their Fridays in Göttingen. You are surrounded by hundreds of fine books, all of which you should peruse, even read, yet your energies, or lack thereof, direct you to the long black couch on which so many distinguished artists have taken refuge during nightlong press checks. Only two are in this building tonight. 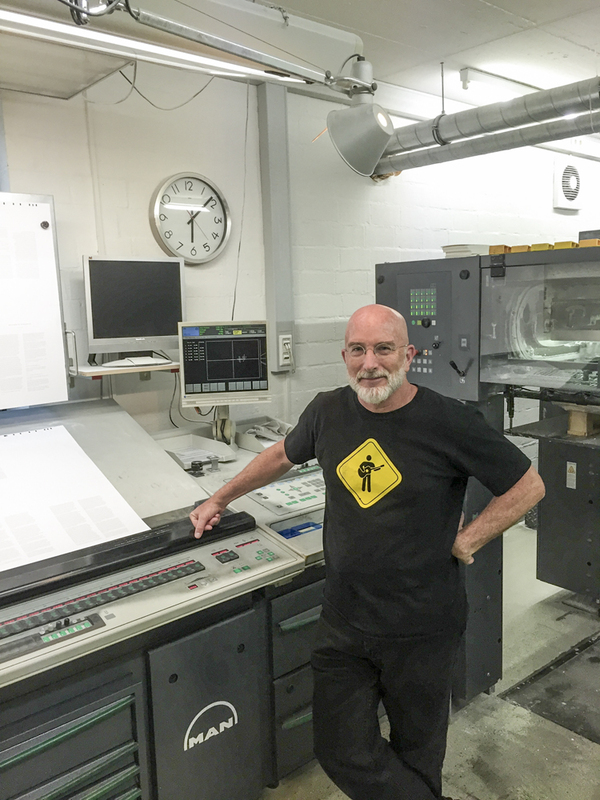 Downstairs, the pressman works his craft to reproduce my images on paper. My preparatory work and the collective work of the Steidl team means that I am approving that which I already know will look good. Upstairs, I move between the desire to be “productive” and wanting to loaf, doze, be entertained by whatever means. My fatigue prevents significant work that requires full brain engagement, so I meander among a range of diversions, unwilling to simply let go. 00:35 – The phone rings in the corner. Michael calls me down to view another sheet. Michael is a man of few words. A fiction writer would have a field day imagining or creating his character. A man as skilled as any at making images look great on paper, one still senses that he much prefers the solitude of his solo night shift, a time when smoking is not forbidden in the pressroom. Sleeping through much of the day, is the remainder of his life one of solitude on par with his work? We will not have a conversation this evening to find out. 1:45 – I am now napping between press checks. If done right, I can get 45 – 60 minutes before the phone again rings. 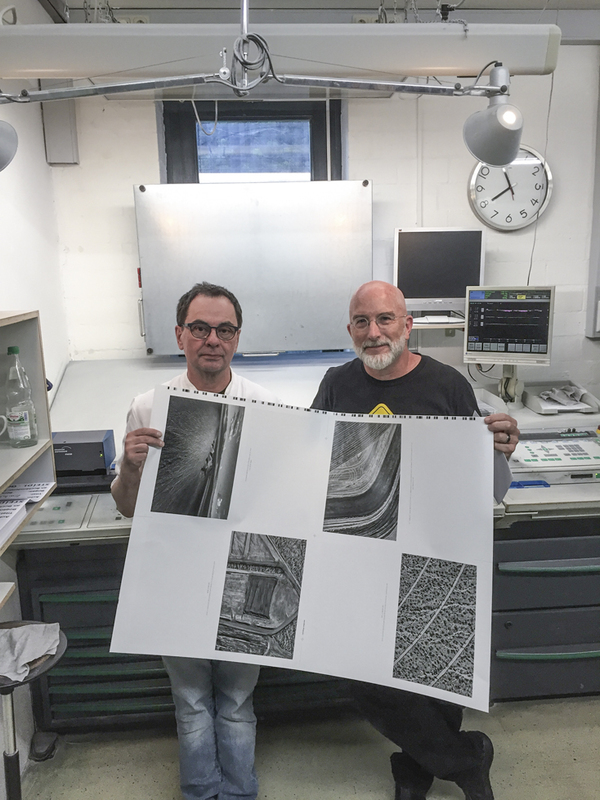 4:21 – Last press check done. The dawn’s early light is on the eastern horizon. Time to get back to the room for some quick sleep. I need to be out of the room this morning, so someone else can arrive. At 11:00, I will meet with Gerhard to go over some of the questions and thoughts I have. To sleep in a bed, not on a couch! I am excited to see the book as an F&G. Everything looks good. Of course, I see a few photos that I might interpret differently, now that I see them together. But these are minor points. The cover, the endpapers, the text pages, and the plates all look great with the clear vision of the new day. 11:30 – Gerhard is in a long meeting with Peter Zimmermann and a Polish photographer/entrepreneur. 11:55 – Gerhard calls me down to the pressroom. “Have the two of you met?” he asks, as I greet the man in front of me, who I had only seen in passing the evening before. “Hi! I am Robert Polidori.” Robert is a superstar in the world of fine art photography. Much of his subject matter is of interest to me. I admire his aesthetic and visual approach. He and Gerhard have published many books together over a period of about sixteen years. Gerhard takes us outside and into the Günter Grass Archive next door. The house, with timbers dating to 1307 and uniquely renovated to show the many layers of its history, is the oldest house in Göttingen and may be the oldest in Germany. A labor of love and a “money grave” for Gerhard, the building will house Grass’s archives, provide a location for research, and a small space for public meetings or forums. Robert and I have a great lunch – a chance to listen and learn about his creative approach, experiences, eccentricities, and his long relationship with Steidl. 13:45 – Back at Steidl, Gerhard asks me to come back later in the afternoon, sometime after 3:00. When I do, he asks if we could put off our talk until Sunday. “Anytime!” he says. 20:00 – I take off on my rented bicycle to the south of town on bicycle paths that take me alongside roads, lakes, and through farmed fields of wheat and corn. What a wonderful evening and a refreshing ride. I wish the family were with me, as these paths would be perfect for easy and safe family riding. Late morning – I slept in as long as possible. The fatigue of a 24-hour press check lingers in both body and brain. 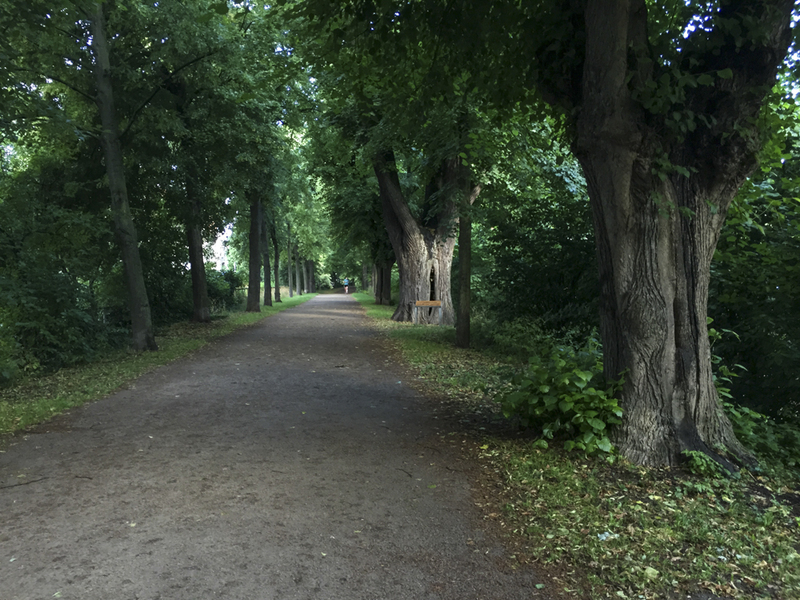 I stroll out onto the quiet Sunday streets of Göttingen in search of coffee and brunch and return to my room to pack for an afternoon train trip to Frankfurt. Tomorrow I fly home. Sunday is a day of relatively few interruptions for Gerhard. He is working at his desk when I arrive and in the middle of a project. Might I wait for a bit up in the library? Finally, Gerhard calls and asks, if I might come down. In about 20 minutes, we work through my list of remaining questions about the book, our agreement, and thoughts on moving the book out into the world. With luck, the book will launch in Europe in September, later in the autumn in North America. Changing Perspectives is a long-term project documenting renewable energy development. The project’s first phase began in 2010, with a flight over the future site of Ivanpah Solar in the Mojave Desert of California. 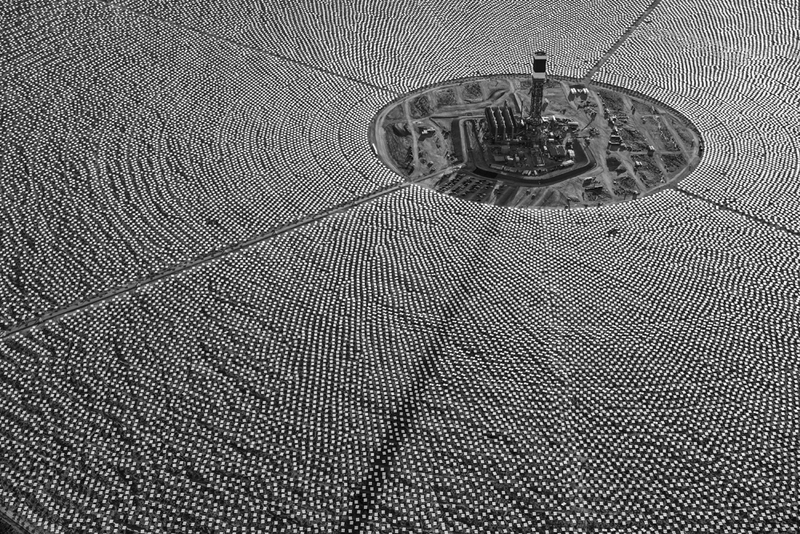 The Evolution of Ivanpah Solar became a four-year look at what is now the world’s largest concentrated solar power plant. Completed in 2014, Ivanpah Solar has the capacity to produce 392 megawatts of electricity, enough to power 140,000 American homes. Changing Perspectives builds upon the Ivanpah Solar work by expanding my look at energy development in the American West. The project’s main focus is on utility-scale renewable energy, though the impacts of fossil-fuel energy extraction, production, and exportation will also be areas of concentration. In our inexorable quest for energy to meet the growing demands of a consumption-dependent culture, we are transforming our natural, rural, and urban landscapes. The need to examine such transformations with an aesthetic and critical eye is compelling and necessary. To think consciously about the decisions we make, or have imposed upon us, we need to see these changes. As an artist, with aerial photography as a principal component of my work, I explore perspectives distinct from those found on earth’s surface, revealing information and insight otherwise concealed. Ultimately, the issues surrounding energy are global in nature. Renewable energy projects are being built around the world at a remarkable pace. I am actively working to transform Changing Perspectives into a project of global scale. By observing contemporary changes in energy development, I strive to create imagery that is relevant both to our present-day collective conversation and to an eventual historical perspective of this era on Earth.